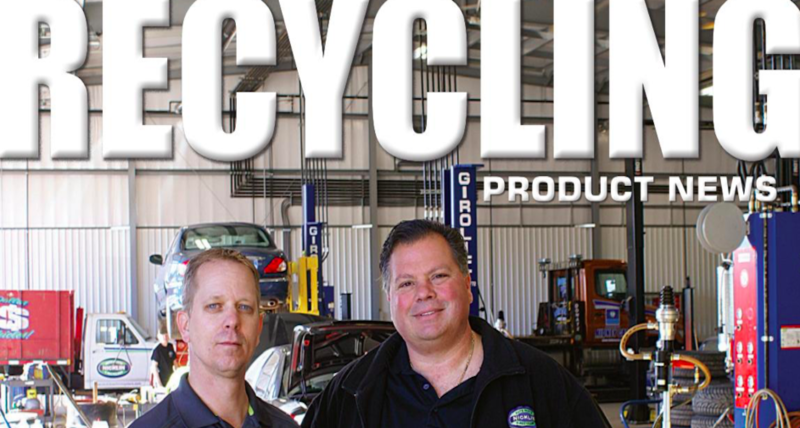 This article was originally published in the May/June 2018 edition of Recycling Product News, Volume 26, Number 4. China’s import restrictions and prohibitions on waste continue to disrupt markets around the world, causing a reassessment of entire value and supply chains. For far too long jurisdictions relied on foreign end-markets, and focused mostly on collection and sorting infrastructure without making parallel investments in domestic processing. Relying so heavily on a single market to process materials has made Canada and other nations vulnerable to losing material to disposal. There may be a silver lining, however. The abrupt and direct restrictions have forced programs and services to reconsider how recyclables are defined and the degree to which their markets are considered sustainable – in particular, packaging. Private and public service providers have worked tirelessly to perfect collection and sorting within the balance of costs and performance. Co-mingled collection became the preferred option over source-separated streams for many as offshore markets, with less expensive labour, tolerated higher degrees of contamination. This was exacerbated with constant change of packaging composition and an increased use of plastic. 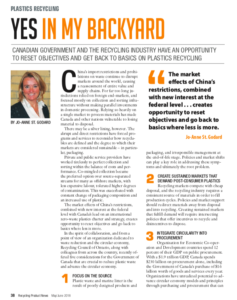 The market effects of China’s restrictions, combined with new interest at the federal level with Canada’s lead on an international zero-waste plastics charter and strategy, creates opportunity to reset objectives and go back to basics where less is more. In the spirit of collaboration, and from a point of view of an organization dedicated to waste reduction and the circular economy, Recycling Council of Ontario, along with colleagues from across the country, recently offered five considerations for the Government of Canada that are crucial to reduce plastic waste and advance the circular economy. Plastic waste and marine litter is the result of poorly designed products and packaging, and irresponsible management at the end-of-life stage. Policies and market shifts can play a key role in addressing these symptoms and ultimately the root problem. Recycling markets compete with cheap disposal, and the recycling industry requires a consistent source of materials in order to fill production cycles. Policies and market support should redirect materials away from disposal and into recycling. Creating sustained markets that fulfill demand will require intersecting policies that offer incentives to recycle and disincentives to dispose. Organisation for Economic Co-operation and Development countries spend 12 percent of their GDP on public procurement. With a $1.9 trillion GDP, Canada spends $230 billion on procurement alone, including the Government of Canada’s purchase of $16 billion worth of goods and services every year. Organizations have unrealized potential to advance circular economy models and principles through purchasing and procurement that can meet environmental and economic objectives, including those specific to reducing plastic waste. We can shift markets through service agreements that favour access over ownership, change vendor relationships to require product take-back, and integrate specification that minimize plastic or require products designed to be easily recycled. China’s historical demand for recyclable material contributed to a shortage of ongoing investments in local plastic recycling markets. The combination of cheap disposal, lack of infrastructure and over-reliance on foreign markets has made nations vulnerable to losing recyclable plastic to disposal. Any plastics strategy must encourage and support domestic growth in recycling industries to manage and process material locally. Canada has a patchwork of policy approaches to waste reduction and recycling, and suffers from disparities that affect provincial performance and markets. There is no consistency in data reporting, measurement or definitions of recycling and/or disposal. There is also an absence of benchmarking and goalsetting that causes substantial variance in performance. According to Statistics Canada’s biannual reports on waste – the only national data available on this topic – provincial diversion rates range from as low as 15 percent to as high as 40 percent. The introduction of national standards could be the catalyst to create harmonized frameworks, facilitate consistent data collection and set national targets for plastics waste recycling. Implementing these five actions requires a multi-layer strategy strengthened by improved policies, incented markets and changed behaviours. We also need to support sustained markets that handle discarded plastics and other packaging – managing them in a way that keeps them at their highest use at all times, and shifting production and consumption cycles away from the linear model of consumption to one that maximizes the value of products and materials throughout their entire life. For far too long we’ve focused on collection to measure performance. We have an opportunity to finally shift markets and improve resource efficiencies around the world, starting in our own backyards. Let’s not waste it. Jo-Anne St. Godard is executive director of Recycling Council of Ontario, a not-for-profit, membership-based organization involved in policy, education and project work around the issues of consumption, waste generation, reduction and diversion, and recycling.